History. What would you cook for your favourite historical figure? 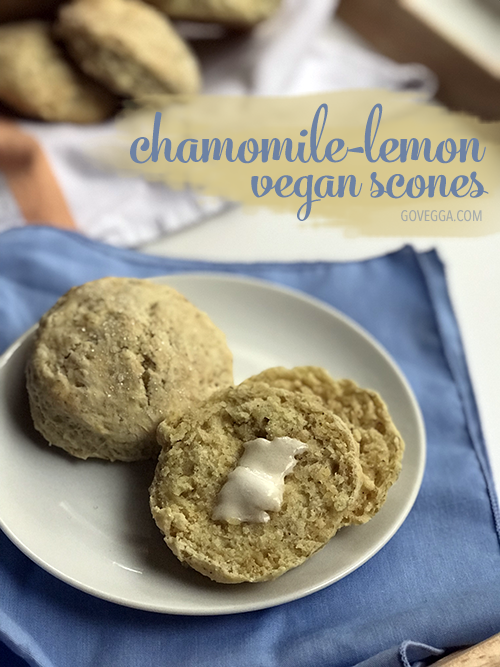 The idea for these chamomile-lemon scones came to me a few weeks ago, but I haven’t had the energy to try them till this weekend. On our all-vegan fjords cruise last month, Steven and I became wholly enamored of the afternoon tea tradition. Between 3:30 and 4:30 PM, we could choose from a massive display of little finger sandwiches and sweet treats — including lots of vegan scones (served with cream and jam, of course). We inevitably filled up on all these delicacies, but that meant we just availed ourselves of a later dinner. No problem. This is perhaps an obvious pairing, but I’m going to invite Jane Austen over for afternoon tea. I wouldn’t say she’s my all-time favorite historical figure, but I’ve long admired her writing and think she’d be a lively companion. I could ask her all about her life and her works, getting answers to the questions biographers have puzzled over for centuries. We’d chat over pots of dark tea and heaping baskets of scones — including these chamomile-lemon ones. 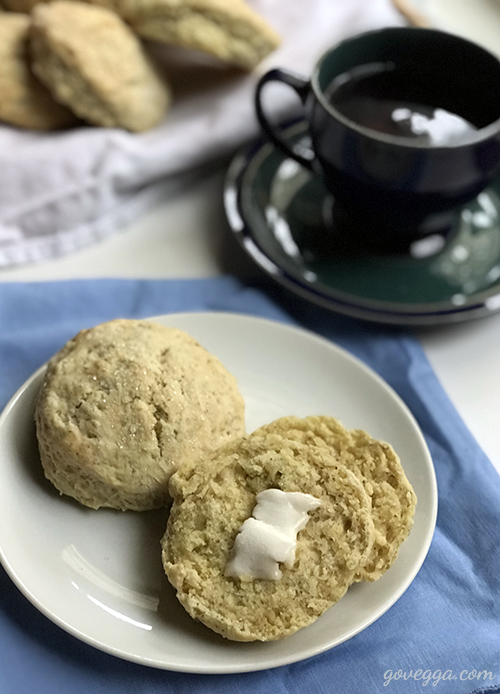 This is a relatively straightforward vegan scone recipe, but the inclusion of dried chamomile and lemon gives these scones a somewhat unusual — yet subtle — flavor. They’re not super sweet, so feel free to add a little more sugar if you’d like. I opted for refined coconut oil as my fat of choice for; unrefined will give you a more coconutty flavor, and you could easily substitute vegan butter or shortening. I also used oat milk instead of the usual suspects (soy, almond); it’s America’s Test Kitchen’s alt-milk of choice for baked goods, so I figured I’d give it a shot. (Look for a review of their new(ish) cookbook, Vegan for Everybody: Foolproof Plant-Based Recipes for Breakfast, Lunch, Dinner, and In-Between , soon!) For the chamomile, I used the contents of a few teabags, but looseleaf would be a great choice here as well. Serve these with butter and vegan clotted cream, if you’d like! Preheat oven to 400˚F and prepare a baking sheet by lightly oiling or lining with parchment paper. In a large bowl, sift together the flour, baking powder, baking soda, and salt and mix until combined. Add the coconut oil and use either a pastry cutter , your fingertips, or two forks, cut in the oil to make a crumbly, sand-like mixture. Make a well in the center of bowl and add the rest of the ingredients, holding out some of the milk. Mix gently until a soft dough forms. If it’s too dry, add the rest of the milk. Turn dough out onto a well-floured, clean surface. Flour your hands and gently give the dough a few kneads. Pat dough into a circle about 3/4″ to an inch high. Using a floured cookie cutter or a glass turned upside-down, cut out circular scones about 2 1/2″ in diameter. Transfer scones to the prepared baking sheet. (Optionally, dust the tops with extra sugar.) Bake for 17-20 minutes or until the edges are slightly golden. Remove from oven and let cool for a minute or two before serving. I am also a foolish man. These food look so delicious and yam mi. I wanna to try these recipes at my home. Thanks.